I was very pleased that this book was chosen for the PPK Challenge. I like Dreena and have a couple of her other books, but not used any of them an awful lot. I have been a bit confused by this book since it first came out so I wanted the challenge to give me a chance to disregard some of the things I don’t like much about the book (more later) and chance to try the actual recipes. First up I tried the jerk chickpeas. These were really very easy and totally delicious; an excellent introduction to the book. I used a bit more chilli than the recipe called for, but even without it I would have liked it. I served it with brown rice and the coconut spinach from the PPK blog which I’d made in testing for Isa’s next book, and knew would go perfectly. The whole meal was delicious and I’ll make it again. 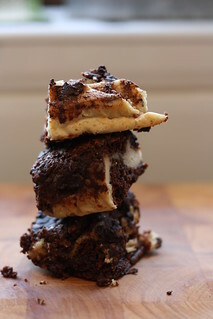 As you will know if you’ve read this blog for any length of time I am not a baker and I don’t really have a sweet tooth, but something about the cream cheese brownies with salted dark chocolate topping really appealed to me. These were a little fiddly to make; spreading the layers was messy and I really had to trust Dreena when she said that they’d spread out and work, but they did. We enjoyed these both warm with ice cream and cold with a cup of tea. They kept a great fudgy texture for almost a week too, so they’re recommended for those who like us don’t get through sweet food very quickly. 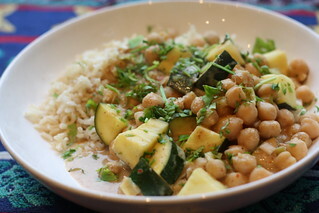 Next I tried another chickpea dish, the Thai almond chickpea curry. This was another easy midweek meal though it did confuse me a bit. You need to blend your own sauce and it cooks in the oven for quite a long time but still calls for bought curry paste. I am definitely not a snob about bought curry pastes and I do use them, but usually when I either want a very quick meal or have nothing fresh in. This seemed to be a halfway house which was neither one thing nor the other, but it was still very rich and tasty. I’d use a higher ratio of vegetables to chickpeas, but that’s easily altered. Probably just not suited to the way I cook, but I can’t see myself making it again. I did try another recipe that I don’t have a picture of, which was the romescoat sauce. I used it two ways – first over pasta with spinach, and secondly as a sauce for bulgar wheat, baked tofu and broccoli. It was quick and tasty and Matthew couldn’t guess that there were oats in it at all. A good versatile standby sauce. 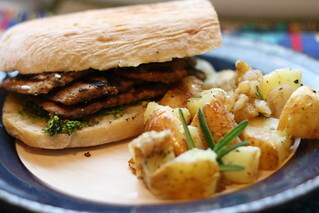 Finally, I made the tempeh tickle and put it in a sandwich with pistachio pesto and served it with the olive oil and vinegar potatoes. Three recipes in one meal! This came together very quickly because I marinaded the tempeh the night before. I did cut the potatoes smaller than Dreena suggested so that more of them got tossed in the oil. I liked all 3 recipes enough to make them again; the tempeh was a nice change from the bacon style versions I usually make. Altogether I made 7 recipes from this book over the course of 2 weeks, which is pretty good going. 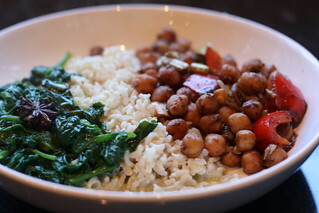 I did enjoy everything I made but the one I’ll probably make again the most would be the jerk chickpeas. The challenge definitely made me look harder at this book. Some of the editing/publishing put me off it before. I’m not keen on the way they presented the photos and I dislike how they make the ingredient lists look way longer than they really are. Also, for people like me who don’t have much of a sweet tooth the book seems a bit unbalanced as it’s very heavy on sweet food – but for most people that wouldn’t be a problem at all. Overall I’d say it is aimed at those people who want to eat healthily but who do eat oil and sugar etc (I think it is pretty much wheat free). I will return to this book and her earlier ones and see what else I can try! 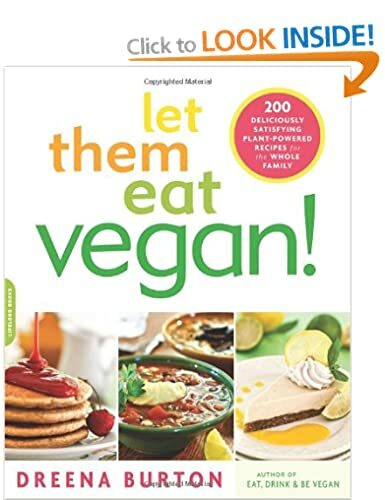 This entry was posted in Let Them Eat Vegan by efcliz. Bookmark the permalink. I won this book this Spring and I really like it so far. I’ve made the jerk chickpeas as well and they were great. I recommend the Goji berry cocoa granola, they are really good. I agree with you about the high number of dessert recipes. But I have to say the cream cheese brownies are tempting me right now. I think I’d rather make my own curry paste if I’m making a long recipe, especially that vegan curry pastes are not necessarily easy to come across. The recipes you tried sound so good, especially the cream cheese brownies!